This is my training diary. I’m what horsey folks call a “re-rider,” meaning I rode a bit as a kid, and then went decades without riding. My skills were rusty to the point of disintegrating when I started volunteering at a Thoroughbred rescue. I reacquainted myself with horses, and took some lessons, dreaming of the day when I might get on one of the ex-racers myself. I was pushing forty when I finally decided that it was time to buy a horse, and realize a lifelong dream. 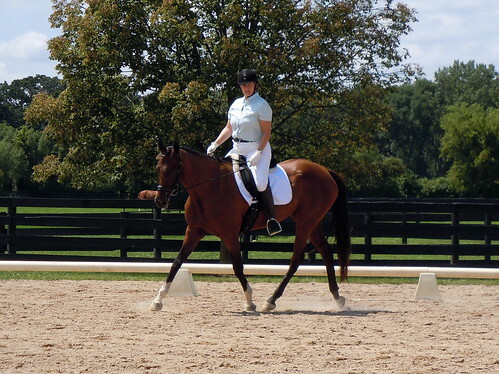 The husband took some convincing, and a retired Thoroughbred named Jaguar Key came into my life. He was tall, dark and handsome – a little girl’s fantasy truly come to life. And thus began my journey from a total no-nothing noob to an aspiring dressage rider. Today, my riding is a bit better, but I still have a lot to learn – I realize how much I *don’t* know on an ongoing basis. Horses keep a person humble. The happiest girl in the world - Jag and I on the day I purchased him. Jag taught me a lot. We survived a case of founder and an ill fitting saddle. Gradually I became a less horrific rider. We got to a few shows – just showing Intro – and he proved himself to be the most confident, reliable, level-headed horse on the planet. Jag was the perfect partner for a gutless ammy. Unfortunately, I had to retire him from riding due to a case of kissing spines that we couldn’t remedy. He’s boarded with at a gorgeous farm that breeds KWPN jumpers. He’s living the life. I visit him weekly, to ensure he gets enough treats to last him another week. What can I say – he’s my boy and I love him. I’ve been riding one of my trainer’s horses this year – another retired Thoroughbred with a simply tragic Jockey Club name – La Cheryl. We call her Maddie in the barn and on my list of things to do in early in 2011 is to figure out a decent show name for her, because I will be damned if I’m going to sashay into the ring aboard something named La Cheryl. She’s the reason I’ve started chronicling my experiences. Jag was easy. Mads is not. She is making me work for everything I get from her, and she is absolutely requiring me to be a better horsewoman. I appreciate her, and like her more each day. We’re working well together, and are developing a partnership, coming to an understanding. She’s a fancier horse than Jag – we’re already working at a higher level than I ever managed with my boy. I’m excited about showing her in 2011. Nailing training level is my goal. In just a few posts I can see that taking time to reflect, thinking about my rides and reviewing the footage, really helps me solidify my learning. I love reading about your adventures with the wonderful creatures we call OTTBs! Derby is absolutely gorgeous. Thank you for sharing your experiences!! I’m excited to list you on my favorite blog list at A Girl and Her Horses, and I can’t wait to come back and read more! Hi! I found your blog while surfing the Paulik Report and reading up on the crazy out there taking in rescues for slaughter. What a whacko, right!? Anyway, I am really happy to find another horse blog out there. Looking forward to following! Thanks for dropping by Julie, glad to meet you too! Just found your blog! As a fellow OTTB lover, I was happy to find yet another blogger with the OTTB love! Hey! I just found your blog, and when I realized that you own an OTTB i was like “This is awesome.” I am a big fan of OTTBs, hoping to get one someday. Anyways, it’s nice to meet you!